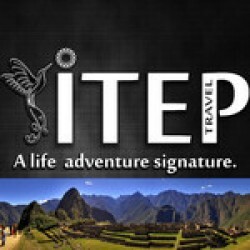 Inka Trail Expeditions Perú "ITEP EcoTravel", is a DMC Tour Operator Since 2012 in ,Perú- Southamerica. Our main base offices are in Machupicchu , Cusco and Lima-Perú and also we have representatives along our mean destinations. *Inka Jungle Adventure "Biking, river rafting, trekking, Zipline and Sky Lodge experience"
* Luxury Glamping and Bed to Machupicchu.